We are staying at a hotel in Matsuyama which is in Shikoku region. (It is far from our town. )Before I started to a trip, I was very busy. So I booked a room by Internet. Probably the staff of a hotel doesn’t know that four people stay at this small room now. I hope they will not know abut it tomorrow. I don't want to pay money more for this room. Anyway we got the room. This room has an Internet cable. That is nice for me. So I am trying to post my blog on my husband computer. We are going to a hot spring tommorow. After I come back to my house, I can show you our pictures. We are staying at a hotel in Matsuyama. Before I started to a trip, I was very busy. So I booked a rooml by Internet. I hope they will not know abut it tomorrow. I don't want to pay money more. Anyway I got a room. That is ok.
Today my older son's teacer visited our house. Every April the elementary school's teacers visit their stuednts' house. That is Japanese educational way. When the teacher visits their students house, he asks about their stuednts to parents and he cheaks routes to school. By the way, we go to trip. I take a break for a while to post. Jay said it was brought back from Japan in the 1970's by one of my mother's friends. 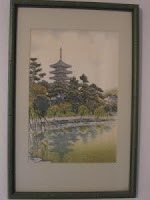 It's a Woodblock Print bought at the Uchide Art Co. at the Kyoto Handicraft Center. It is titled "Sarusowa Pond in Nara" and it was done by Nisaburo Ito. The five storied pogoda is Kofukuji and it still stands and is one of Japan's tallest, and is the symbol of Nara. I wonder if those places in Kyoto are still around. In 1970's Expo '70 was opened in Osaka. I thought they might visited Osaka ,Kyoto and Nara. I love Kakinoha sushi. Kakinoha is persimmon's leaves. If we say it in English, it is Leaf sushi of a persimmon?? My uncle sent me this pic. When I was young, my mother said "You eat shiitake. After that you get sunshine outside." But I didn't like dinners using shiitake. Usually kids don't like mushrooms. Kids are looking their parents. It is important parents’ behavior. Don’t cross a red light. Do jobs that a person hates. Don’t speak evil of someone. Don't say "I am busy. I can't it." But I can’t do anything. Parents’ jobs are hard. I want escape parents’ jobs, especially kids school jobs(PTA). I try to enjoy that job(PTA). But now I am blue feeling. 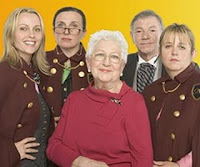 When I watched TV show yesterday, I found Nanny 911. It was very funny. I wish they would visit my house. Schools start in September in Meiji period in Japan. But the fiscal year of the country changed in April. Therefore Japanese schools might start in April. I think entrance ceremonies need cherry blossoms in Japan. It is important of cherry blossoms. 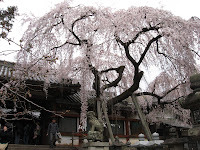 Cherry blossoms and entrance ceremonies are Japanese culture. If Japanese school system will change like The USA's. I think I feel strange. But recently a lot of kids have to study for examinations in vacations. I think it is terrible!!. If Japanese schools hadn't started in April, entrance ceremonies would have not meant much for the Japanese. The picture was not sharply focused. My uncle said he went to a Hanami last week in Nara. Unfortunately this week it is raining day in my town. 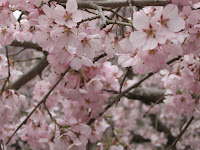 It is difficult to keep cherry blossoms. Now there are a lot of falling cherry blossoms near my apartment. In Japan schools begin from April. This year is the end of year for my younger son in his preschool, and my older son is the fifth grade in his elementary school.